Hi, My name is leave it! 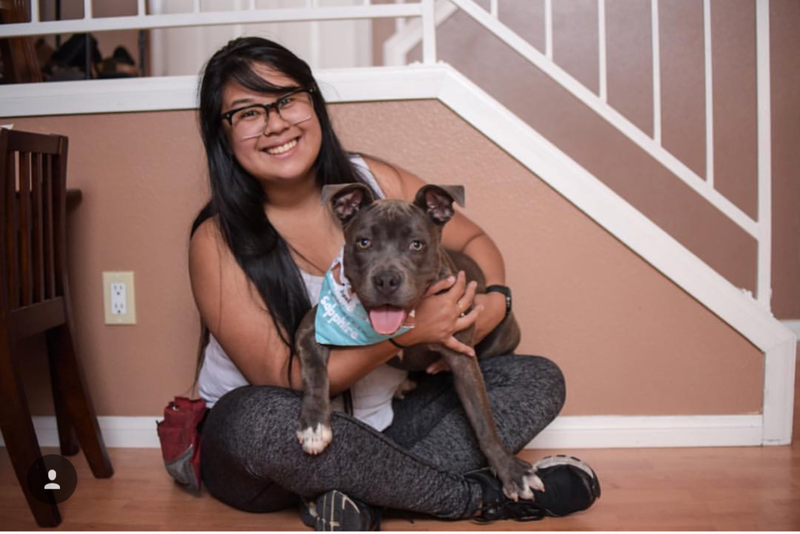 I feel so fortunate to have connected with Nicole Parayano with PupScouts Dog Training to answer some of your most frequently asked questions! Now, there are MANY MANY MANY different types of dog training out there and some techniques work better for different dogs so just know that when working with your pup! 1) Should my puppy go to dog training? Absolutely! There are so many options that you can look into! You may find a great trainer in your area that can give you awesome one-on-one guidance with you and your puppy, or you can enroll your dog in group training sessions which tend to be a great opportunity for your pups to socialize! Some families might choose to self-train, while others might opt for sending their pups off to a board and train program. Regardless of which way you go, training your pup is essential! A tired pup is a happy pup, and by training with your dog, you are stimulating their brain, and get them physically AND mentally tired! Training helps build a firm foundation and a positive relationship between you and your pup, and who doesn't want that?! By training basic obedience commands, socializing, exercising, and understanding your dog's needs, you will likely avoid problem behaviors that many families run into. 2) How young should i take them? Training begins the moment they come home. My beloved Cookie, who passed away last year, entered my life at 8 weeks old, and the moment I took her home, we worked on potty pad training and responding to her name. The very next day Cookie adjusted to wearing a collar. Little things that might seem meaningless all serve a purpose! Every interaction with family in the home was made a positive one. You might not know it, but your dog is watching you and they are learning that the things that they do cause you to react in a certain way. Puppies have a short attention span, so depending on their age, you're lucky if you can get 5 minutes in! Of course, when you get a new dog they have to adjust to their new life in their new home. After all, we've just flipped their lives upside down! They've been taken from their littermates and their momma, and now here they are, with new sights, new sounds, and new smells! Try not to overwhelm them and go at your own pup's pace :) It's never too late to start training with your pup, however, the earlier that you can start, the better! 3) How does training help? Training builds trust and it also creates mutual respect. Training is also a great solution for energetic dogs! You stimulate the brain and make them think. By using all that mental energy, they'll be pooped in no time! Training may also save your dog's life. For example, someone leaves the front door open, and Fido bolts out the door! A quick, "Fido, come!" would make him turn around and head safely into your arms. Another reason why training your dog helps is because fewer trained dogs end up in a shelter when families invest some time and effort every day to commit to training with their dog. 4) Which parent is the alpha? Anyone can be a leader in your dog's eyes if you have a history of reinforcement with them. The respect is earned, not given and I don't believe that there has to be ONE leader. Your dog will interact and work with both parents, in their own way. However there might be times when you are both together, and Fido seems to gravitate toward mom more than dad. For example, Cookie, my previous pup was phenomenal with all of her basic obedience commands, her tricks, and her ability to distinguish a specific scent. She listened perfectly with me, and she also performed just as well with my partner. But put us both in the same room with her and she'd likely choose me (almost) every time. The respect is there, but because I spent the most time with her, fed her the most, trained with her the most, etc., I had a slightly stronger bond with her. If you want your pup to listen to you equally, then you both need to put the same amount of work and effort into training with your pup. 5) How can i get my dog to listen to me? When your dog doesn't listen to you or your commands, it can definitely feel quite frustrating. What I find helpful is allowing my dog some exercise before training. If they've got pent up energy, how can they focus on you when all they want to do is GO, GO, GO? Allow them some time to release that energy and then work on training. It's also important that you remain consistent with training. Sit down with each member in your household to ensure that all the verbal commands, hand signals, rules, and boundaries are all the same among everyone. If one person lets Fido on the couch and you keep telling him to get off, he's receiving mixed signals! Another thing to keep in check is your energy. Dogs will listen to and respect someone who is calm and assertive. Dogs feed off your energy and your body language and if you are nervous, unsure, or angry, you're giving off the vibe that you aren't in control. Lastly, if your dog isn't listening to you, maybe it's because they don't actually understand what you're trying to relay to them, so go back to the basics and work on whatever it is that you're doing needs to work on. Training takes a lot of time, and hundreds of repetition and reinforcement for the dog to perform the way you want them to. 6) My dog pulls on their leash, how can I get my pup to stop!? This can depend on how old your dog is. As a puppy, it's normal for the dogs to pull back and "halt". Puppies are likely to refuse to move forward, chew on the leash, pancake to the floor, or pull back because wearing a collar and a leash is totally foreign to them. However, if your dog is older, they're likely pulling, instead of anchoring themselves to the ground. When walking with your dog, sometimes a quick "U-turn" helps. A "U-turn" is when you're walking forward, notice them pulling, and you quickly walk in the opposite direction. This requires a lot of patience, time, and treats. I always carry treats on me, and you can also try a luring method. What you can do is take a treat, keep it close to your dog's nose, and begin walking with them. When they are at a pace and placement that you like, you can release the treat to your dog, followed by verbal praise, and the command that you choose to call it ie: "heel". Begin walking forward again with another treat luring your dog to match your pace and stay in a position that you approve, and then release the treat! In order to have a harmonious walk, you need to practice, practice, practice! Some trainers find that standing still until the leash relaxes works, and that is definitely something that you can try doing as well. Reward FREQUENTLY, walk ROUTINELY and remember to keep your energy in check. The more frustrated you are with the situation, the less likely your dog will want to focus on learning with you. I like to practice leash walking skills in the home first, so your dog is free of any distractions, and then you can eventually begin the same practice outside. 7) How much food should I reward my dog with? It depends on your dog's age. If you are using treats to reward your dog, good for you! But make sure that you are using low-calorie training treats that are small and chewy because with training and treat rewards, you're likely going to be giving them a ton of treats! Bigger treats that take time to chew on take time away from training because you're spending several seconds waiting for your dog to finish just that first treat! Some younger pups can use their kibble for training in the beginning. You can use their whole cup of breakfast/dinner, or half of their breakfast/dinner for training if you feel so inclined. Keep in mind though, that you want to gradually wean off treat rewards. Once your dog has mastered the given verbal command and/or hand signal, you can replace a treat with a pet on the head, a belly rub, verbal praise, etc. But the goal is to eventually remove treats from the equation. If your dog is given treats every time for the same command, they will likely lose interest and no longer perform the command as consistently if you stop the treats cold turkey. 8) My dog has a social anxiety problem, how can I help him? It's so important to socialize your puppy at a young age to avoid having social anxiety. However if it seems like your dog already is socially anxious, you should start slow with public interactions. See what exactly makes your dog anxious or fearful; is it another dog? A specific person or type of person? Is it the sounds of cars passing by? Figure out what exactly makes your dog anxious and work your way toward desensitizing and normalizing those things to your dog. Desensitizing your fearful or anxious dog requires a lot of time, patience, and positivity! Take it slow. It's important that you don't cuddle them or try to comfort them when they are in their fearful mode, as this reinforces the scared behavior and teaches the dog that it's okay to be afraid because they will be rewarded with hugs. Make every outing fun. The process of socializing your dog and desensitizing your dog can vary depends on how badly they react to whatever it is that is scaring them. 9) Every time I leave my pup at home they are crying for me. Sounds like your pup is anxious! Or bored. Your dog probably isn't used to being along or having their own separate downtime, away from you. This could be a small form of separation anxiety, and it's definitely something that you want to take care of ASAP. First and foremost, I like to use a crate for my dogs while I'm away. I can leave my dogs in their crates for short amounts of time with a toy and that way they aren't having any accidents while I'm away or destroying everything around them in a panic frenzy. Whenever your dog is crying, whatever you do... DO NOT give in and return to your dog. This will teach your dog that if they cry, mom or dad will always come back, and this allows them to control the relationship. You need to desensitize your dog to you leaving them alone. Start small and give them short amounts of downtime to themselves while you're home. Leave them alone and stay just outside the door, quietly. Eventually, distance yourself further and further, and increase the length of time in which you are away from your dog. When they're quiet, you can come back to them and calmly let them out (feel free to give them a treat too!). But you just don't want to let them out until they are quiet. It's also helpful if you leave them after they've exhausted their energy! A good way to exercise them is taking them out for a walk before leaving, having some playtime, etc. It's best not to leave your dog home alone or away from you while their energy is off the charts! Leave them when they are calm, do not make a big deal out of you leaving or coming home, and set a daily routine! I like to calmly acknowledge my dogs after about 5 minutes of coming home when they're also calm(er). Another thing you can try doing is leaving them alone with a puzzle toy or Kong toy stuffed with PB! Give them something tasty to focus on instead of you leaving. 10) To crate train or not to crate train? I love crate training. A crate or kennel serves many purposes! If you haven't been reading this in order, I've mentioned the positives of using a crate quite a few times :) Just a few of the positives about crate training: - It's the quickest way to potty train! - Provides a safe space for your pup and keeps them from getting into anything harmful while you're away. - Creates a den and their own "safe space". 11) How to stop puppy nipping and redirect? As a puppy, it's completely natural for them to want to chew on things. They are exploring the world around them and are unaware that their teeth are razor sharp. Your puppy also doesn't realize how much is too much when using their mouth. There are a few things you can try doing. 1) I like to yelp really loudly or loudly say, "OW!!!" and ignore my dog for several seconds after they've chomped a little too hard. Gradually by continuously "removing" playtime and yelping loudly, your dog will learn that biting too hard takes away the fun time. 2) When your pup bites too hard, yelp loudly, wait until they've stopped, and then try giving them a treat that they CAN chew on in place of your hands. 3) Keep tons of great chewing toys available for your dog to play with and chew on. Some toys are interactive and are only fun to your dog when you're playing with them, so if they go for your hands, immediately redirect them to chewing on the toy instead! Remember, your puppy is probably teething right now and needs lots of things to chew on. They will soon begin losing their teeth and it's not very comfortable for them. As they lose their teeth, you can also try soothing them by giving them frozen or cold toys to chew on, it helps with numbing their gums a bit. Eventually, their razor little teeth will turn into adult teeth. 12) How do I know what aggressive play is between puppies? Dogs use signals to communicate with one another. You can tell a dog is trying to play when they "play bow". A "play bow" looks like your dog's rear end is up in the air while his front half is down. This is displayed just before a dog begins to play with another dog. Another way you can tell that a dog is playing is when your dog looks like they're panting, but their mouths are open wider than normal; you can just see in their faces that they are happy, bouncing around, and having fun. I recommend you look into pictures and videos of what aggressive and play body language truly look like to get a sense of what your dog is trying to communicate with the other dog. If things begin to get too heated, separate the two dogs for "time out" several minutes before beginning to play again. This will take time, but eventually, the "aggressor" will learn that this behavior takes away the reward (playing) and they will learn not to behave that way. Keep an eye on the pups, notice the signs, and interrupt their playtime before it gets too crazy. Playing with other dogs is healthy and a great way to not only burn off extra energy, but it's also a fun way to socialize. 14) How to stop digging holes? Digging is a natural behavior in dogs. Your dog could be digging for various reasons: - They're bored and they find that digging at the moment relieves them of their boredom 2) They're trying to escape (anxiety due to separation, something that is scaring them such as thunderstorms, etc) -They smell something or hear something that is enticing to them in the ground 3) They are digging to create a hole to cool down in and escape the heat 4) They're trying to hide their toys/treats. So if you're trying to stop your dog from digging holes in your backyard, you need to figure out the "why". Why are they doing it? And go from there. If they are chewing to get away from the heat, provide them some more shade in the backyard or somewhere to cool down or bring them in.. If they are digging due to boredom, give them toys that they can play with. If they are digging because they're afraid of a thunderstorm, bring them in. If they are digging because of a smell or something in the ground, get rid of rodents that are enticing them and look into finding some sort of digging deterrent. -Make sure they get enough exercise before leaving them out by themselves as well. If you catch them in the act, stop them as they're doing it with a loud "UH UH!!" or whatever "negative" marker word you have for your dog. 15) Does my dog know how to swim? A dog will naturally begin "doggy paddling" when they're in the water, but that doesn't mean they're capable of actually staying afloat. Some dogs might even be quite fearful of water! You can deduce what the case may be for your pup, but I highly recommend purchasing a floaty vest for your pooch to wear when in the pool regardless! Better safe than sorry!